Bruno Aschidamini of Sand Cloud with his business partners and towel products at a San Diego beach. 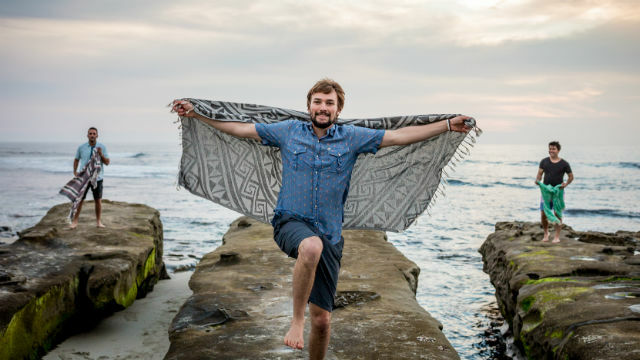 Four years ago, my business partners and I started a company to make better, eco-friendly beach towels. Today, Sand Cloud is a $10 million business that has doubled in size every year. Our company exists thanks to the strong community of beach goers who are passionate about protecting the coast. They cherish beaches like San Diego’s as special places to charge their batteries, have fun, and connect with the outdoors. In fact, I’m one of them, too. Since my childhood in Brazil, I have always lived near a beach. Running a fast-growing company keeps me busy, but I find time to surf—and it always leaves me energized and inspired. That is why our company isn’t really about selling beach gear. We’re in the business of protecting our oceans. It’s why we donate 10 percent of our profits to coastal protection organizations. It’s why we host beach cleanups in San Diego, and provide tools for people to organize cleanups in their own communities. It’s why we’re re-examining our supply chain to eliminate plastic and reduce our carbon footprint. It’s why we never launch a new product without hearing what our environmentally savvy customers think about it. And it’s why we’re supporting local efforts to keep the federal government from drilling in our oceans for fossil fuels. More than 70 cities and counties along the Pacific coast, from Imperial Beach all the way up to Aberdeen in Washington state, have drawn a line in the sand against federal plans to open up our oceans to offshore drilling. A few months ago, the San Diego City Council passed a resolution opposing new federal oil and gas leasing in all U.S. waters, including those in Southern California. Sand Cloud is one of more than 1,000 companies that formed the Business Alliance for Protecting the Pacific Coast to oppose offshore drilling. Governor Jerry Brown and Attorney General Xavier Becerra have made it clear California is ready to fight for our beaches. On the Atlantic coast, New Jersey recently passed the nation’s most significant state ban on offshore drilling. What makes New Jersey’s ban so effective is a provision that prohibits building infrastructure such as pipelines in state waters that would be used to transport oil and gas. Without the infrastructure to bring oil and gas to shore, offshore drilling becomes prohibitively expensive for fossil fuel companies. California has an opportunity to create this same kind of bulwark on the West Coast. The state Legislature is currently considering two bills (Al Muratsuchi’s Assembly Bill 1775 and Hannah-Beth Jackson’s Senate Bill 834) that would prohibit the leasing of state waters for new construction of oil and gas-related infrastructure. In doing so, the bills effectively prohibit the construction of infrastructure needed to bring oil and gas from offshore platforms to shore to be processed. This kind of ban is California’s best defense against new offshore drilling and the risk it brings to our beaches and surf breaks. No incident better illustrates what’s at stake than what happened three years ago in Santa Barbara. Just ahead of Memorial Day weekend in 2015, a pipeline burst just north of Refugio State Beach and spilled more than 140,000 gallons of crude onto local beaches, eventually spreading 150 miles downcoast to as far away as Redondo Beach. Hundreds of sea birds and mammals died, and the disaster caused millions in damages to local businesses that rely on recreation, tourism and fisheries. California’s beaches and our coastal economies cannot afford another Refugio oil spill. Tourism, recreation and fishing in our state generate nearly $20 billion a year and provide jobs for 400,000 people. A quick day trip to any of San Diego’s beaches and nearby hotels, restaurants, surf shops and retailers shows what a healthy ocean means to our local economy and our way of life. The Department of the Interior is expected to release the next iteration of its plan on offshore drilling later this year. We don’t know if California will remain in consideration. We can’t control what happens in federal waters, but we do control our shores. By passing AB 1775 and SB 834, we can send a strong message to Washington D.C. that our oceans are not for sale. Bruno Aschidamini is the co-founder of Sand Cloud, a beach lifestyle company based in San Diego.